There is nothing better than using natural ingredients to get a temporary tattoo. What better way to do so than using henna for body art that you can do yourself, in the comfort of your home, without the needles and pain. If you are feeling adventurous, then it is time to pick up a mehndi henna kit that has all the ingredients to start your body art, complete with instructions and design ideas. We give you here our pick of the best mehndi henna kits that you can try. Mehndi or henna is a flowering plant whose leaves are used for coloring the hair and body art. The leaves contain a dye called lawsone which lends the bright orange red color that coloring with henna gives. The leaves are dried, crushed, powdered and sifted to get henna powder which is then mixed with acidic solutions like tea or lemon juice to form a paste that is used in body art. The powder can be mixed with tea and yogurt to form a paste that can be applied on the hair to cover greys too. Henna body art lasts on the skin for a week to ten days. 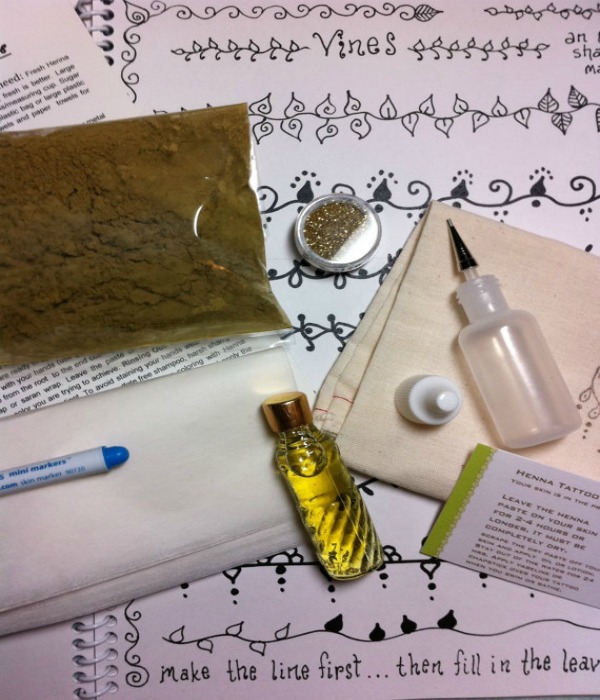 The Henna Kits that are available for sale come with the powder, the solution to make the paste, eucalyptus oil which is applied on the skin before tattooing to get a rich red color, sugar solution which needs to be applied on the design when it dries on the skin, q tips, a designing bottle with a fine tip to hold the henna paste and detailed instructions. Here is a look at the top 5 mehndi henna kits. The EarthHenna Kit contains 100% natural henna powder sourced from Morocco. The henna powder is pre measured and the henna mixing solution needed to make the paste with the powder comes along with it. The powder and the solution are to be mixed and transferred onto an applicator bottle. The kit contains enough powder to make 15- 20 designs. It has reusable design stencils and step by step instructions too. You could even watch the video on their website for instructions about how to apply henna. The Henna City temporary tattoo kit contains triple sifted natural Rajasthani mehndi that is certified organic. The henna mixing solution does not contain any toxic chemicals. It contains 4 sheets of stencils. The body art created with this mehndi kit gives a deep red color, lasting upto 2 weeks. The applicator bottle contains interchangeable tips. The Jacquard henna mehndi kit lets make exotic non-permanent designs with the help of the herbal henna powder included in the kit. It is one of the most popular henna kits sold. 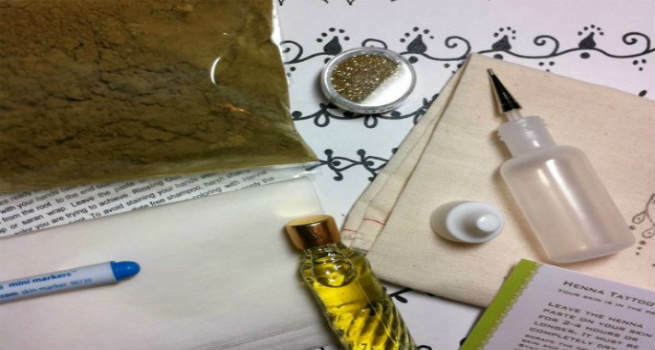 The kit includes henna powder, mordant liquid, applicator bottle, sugar and citric acid solution, eucalyptus oil, q tips, design ideas and an instruction booklet. 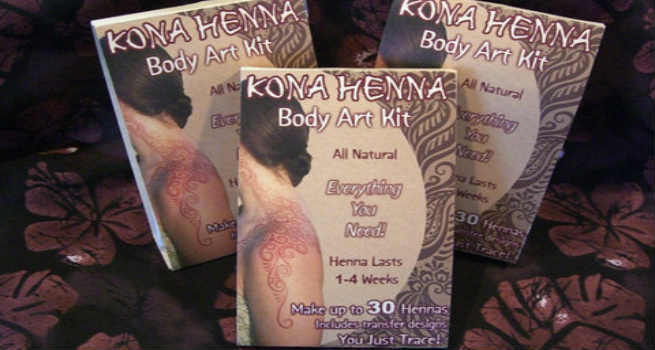 The Kona Henna Body Art Kit includes 2 batches of organic henna powder and Kona Henna Mixing Solution. It also includes a bottle of organic eucalyptus oil and a 0.9 mm tip applicator bottle. It contains designs that can be traced on the body after which you can draw using the applicator bottle on the same design to get a gorgeous red non-permanent tattoo. The Henna King Powder Kit contains 100 gm of premium henna powder, henna oil to make the paste, 0.9 mm jacquard applicator and a design book. It also contains a transfer marker that can be used to copy designs from the design book to your skin. The powder can be used to make upto 75 tattoo designs. They also have hundreds of additional designs that can be purchased off their website.